Archivematica accepts transfers packaged in accordance with the Bagit specification. All standard Bagit checks are run: verifyvalid, checkpayloadoxum, verifycomplete, verifypayloadmanifests, verifytagmanifests. Archivematica differentiates between mandatory and optional bag elements so that if optional elements are not present the bag does not fail the verification micro-service. 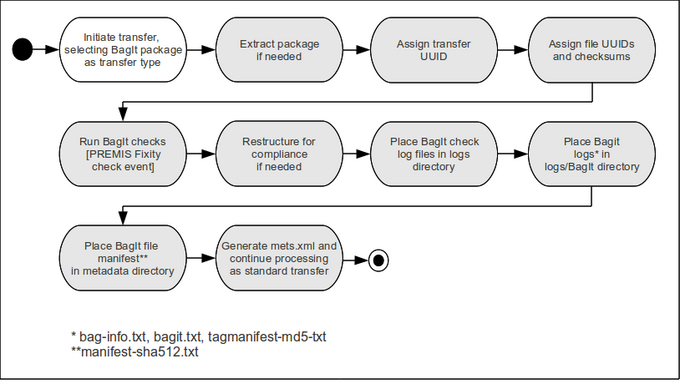 The BagIt checks generate log files that will be added to the logs directory of the transfer. The BagIt file manifest (manifest-sha512.txt) is placed in the metadata directory of the transfer. The other BagIt files (bag-info.txt, bagit.txt, tagmanifest-md5.txt) will be placed in a logs/BagIt directory. No new PREMIS events are required. The BagIt checks are recorded as a fixity check in PREMIS. In this workflow diagram, the white ovals are manual steps and the grey ovals are automated steps. When Bagit labels contain characters that are not valid XML labels, continue processing but print error message and skip labels with invalid content. Add keyword field "Transfer metadata" to drop-down menu in search. This will search all the contents of the <transfer_metadata> container in the METS file (as indexed in ElasticSearch). Add keyword field "Transfer metadata (other)" to drop-down menu in search. This will allow users to search individual fields in the <transfer_metadata> container. When the user selects "Transfer metadata (other)" a separate box will appear which will allow the user to enter the label of the specific field to be searched. Add ability to search date ranges. To search on a date range in <transfer_metadata> or one if its sub-fields, the user enters two dates in ISO date format separated by a colon. For example, "2015-01-03:2015-04-14". This page was last modified on 10 April 2015, at 13:09.